One of the largest stormwater events in the nation, the 11th annual Ohio Stormwater Conference was held May 9-11, 2018, and was attended by over 900 engineers, city planners, landscape architects and municipal officials. Attendees travelled from across the nation to get the latest information on environmental issues, stormwater management technologies, regulatory compliance and pollution prevention. As an exhibitor and presenter at the conference, Belgard Commercial offers some insights and key learnings from this important gathering. One of the highlights of the Ohio Stormwater Conference each year is the number of educational sessions which serve to both satisfy CEU requirements for multiple organizations, as well as increase knowledge on various aspects of the stormwater industry, including Best Management Practices (BMPs), scientific advances, outreach programs and more. Belgard Commercial team member Paul Cureton, PE, offered a standing-room only session titled, “Saving Money with Permeable Pavers,” which dispelled the myth that permeable interlocking concrete pavements (PICP) are more costly than asphalt. 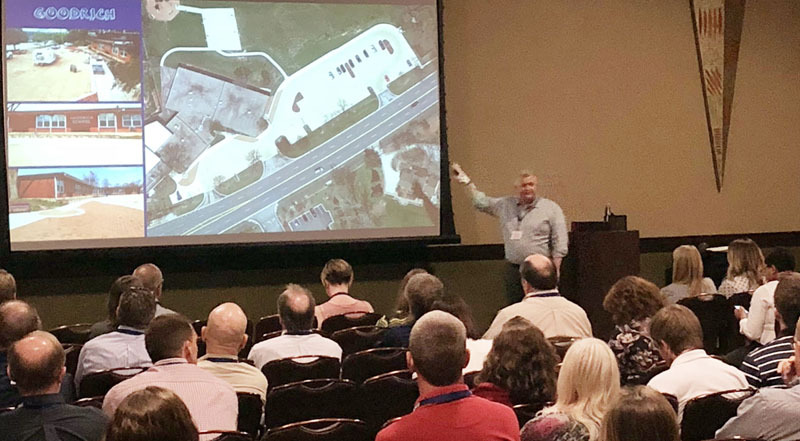 During the session, Cureton presented the case study of an Illinois school district that began using permeable pavers in 2011 with a pilot project to replace aging parking lots at two of its seven schools with PICP parking lots. Research indicates that permeable pavers last 2.5 times longer than standard asphalt, meaning the pilot project represented $1.4 million in savings over 20 years (the expected life of asphalt). The new permeable lots also added a better aesthetic and the additional benefit of reducing stormwater issues for the school. Sidewalk flooding during heavy rains had previously caused heaving and cracking due to freeze/thaw cycles, requiring yearly replacement of the impacted sidewalks. Because the PICP eliminated the flooding, the sidewalks have not required replacement since the 2011 installation. In fact, the pilot program was so successful, the district has now installed PICP parking lots at three more schools totaling over 240,000 square feet of pavers to date and intends to have installations at all seven schools by the end of the next academic year. Another feature of the conference was the number of exhibitors showcasing technological advances in the industry. 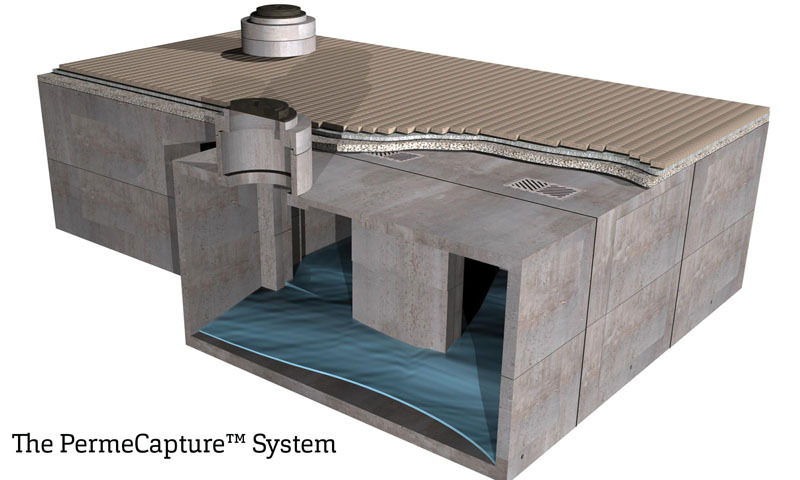 Numerous engineers and stormwater officials were very interested in learning more about the Oldcastle Precast® PermeCapture™ System, which consists of StormCapture™ underground stormwater storage modules buried under a PICP system. The combined stormwater management system is aesthetically pleasing and can support traffic-rated loads. Stormwater infiltrates through the joints of the permeable pavers into the storage units below where it can be stored to control peak flow rates or treated for rainwater harvesting and reuse. Municipalities are becoming more favorable to the use of PICP for roadways as a way to reduce stormwater quantity and improve local water quality. The use of permeable pavements is significantly increasing in the Midwest, especially in the Chicago area due to the city’s Green Alley initiative. The design community gravitates to the look and durability of PICP compared to other permeable pavement systems. Municipal officials are learning that PICP has lower life cycle costs, compared to other systems, dispelling the myth that PICP is more expensive and difficult to maintain. Municipalities are also learning that in most cases, they already own the necessary equipment for PICP maintenance. Despite increased awareness, there is a need to continue expanding education programs for municipal officials regarding the environmental and financial benefits of PICP.